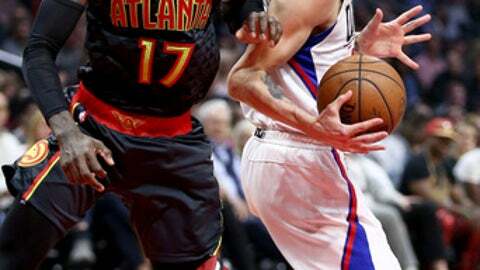 LOS ANGELES (AP) The Clippers’ reserves jumped on the Atlanta Hawks in the second quarter and made them go away. Los Angeles built a 22-point lead by the third quarter on its way to a 99-84 victory on Wednesday night that sent the Clippers into the All-Star break on a four-game winning streak. Blake Griffin scored 17 points and the reserves combined for 42 points. J.J. Redick added 15 points, Austin Rivers had 13 and All-Star DeAndre Jordan had 16 rebounds to help the Clippers beat the Hawks at home for the first time since March 8, 2014. Dennis Schroder led Atlanta with 15 points, and Dwight Howard had 11 points and 15 rebounds. Led by seven points from Raymond Felton, the reserves gave the Clippers the game’s first double-digit lead in the second. Down two points, Los Angeles outscored the Hawks 29-12, helped by five 3-pointers, to go into halftime leading 54-40. Jordan caught Griffin’s jumper that was going to be short and dunked it at the buzzer. The Hawks never got a sustained run going in the third when they trailed by 22. Griffin’s one-handed jam off Redick’s steal and Jordan’s basket pushed the Clippers’ lead to 20. Rivers scored six points in a 13-5 run that kept them ahead 81-59. The Clippers’ defense forced 20 turnovers, including 18 from steals. Both teams rested their starters in the fourth. Hawks All-Star Paul Millsap was held to eight points – well under his team-leading average of 18.1. Fellow starter Kent Bazemore had two points, nine under his average. The Hawks alternated wins and losses in their last five games before the break. They are second behind Washington in the Southeast Division. Hawks: Millsap’s free throw in the second quarter was the 2,500th of his career. … G-F Thabo Sefolosha missed his ninth straight game with a left groin injury. Clippers: Griffin just missed a double-double with nine assists. … They improved to 11-19 without injured Chris Paul over the last two seasons. … They went 5-5 on over two extended road trips from Jan. 21-Feb. 13, when they played 10 of 11 away from Staples Center. … Mariah Carey cooed a few bars to her hit ”Fantasy” when she was handed a bejeweled mic by an in-game hostess during a timeout. Jordan is heading to New Orleans where he’ll participate in the dunk contest, famously won by Griffin at Staples Center in 2011 when he dunked over a car. ”I got a little help from somebody who won the dunk contest before,” Jordan said, declining to name names. Doc Rivers suggested Jordan should ask Saints quarterback Drew Brees to toss him a pass on one dunk. ”I love Drew Brees, but if anybody it would be Dak Prescott because me and Blake are Cowboys fans,” Jordan said. Hawks: Host Miami on Feb. 24 coming out of the All-Star break. They are 2-1 so far against the Heat. Clippers: At Golden State on Feb. 23 in their first game after the break. The Clippers are 0-3 so far against the Warriors.